There once was an ugly duckling… Ah, I think you might know the ending of this story! Never mind, bear with me and allow me to tell you about one of Spain’s most welcoming cities and their fantastic newly refurbished stadium. The city of Cádiz is the oldest inhabited city in Iberia and is also home to the Spanish navy and one of southern Europe’s largest commercial ports. All crammed onto a thin strip of land on Spain’s southern Atlantic coast, you could be forgiven for thinking that this mix of ancient culture and commercial and naval dockyards makes Cádiz a bit edgy. 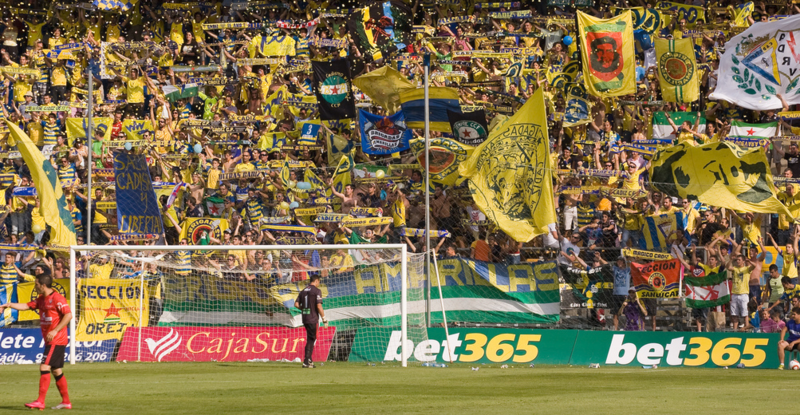 Nothing could be further from the truth as the citizens of Cádiz and in particular, the followers of Cádiz Club de Fútbol are among the most passionate and friendly in the land. All of which makes the newly renovated Ramon de Carranza a fantastic place to watch football. Founded in 1910, Cádiz CF did not register on the Spanish football radar during its early years, which were spent at the city’s velodrome. A move to a new enclosure next to the city’s bullring 1933, led to an improvement in form. The Campo de Deportes Mirandilla as it was known opened on 27 August 1933 with a match against Real Betis. This basic ground served the club as home for twenty two years, during which time the club gained promotion to La Segunda in the season before the Civil War. The ground was damaged following a massive explosion in the navy dockyards in August 1947 and whilst they played on at the ground for another 8 years, it prompted the club to look for a new home. The Campo de Deportes Mirandilla was given an emotional send off when the club won promotion back to La Segunda at the end of the 1954-55 season. Work had begun in May 1954 on a new stadium on the eastern edge of town. Designed by Monasterio and Pujol, who worked together on the Estadio Santiago Bernabeu, the stadium consisted of a ring of terracing around the pitch, with a tribuna on the western side. It was oval in shape and had a capacity of 15,000. On the east side was a tower or La Torre de Preferencia as the locals preferred to call it. It opened on 3 September 1955 with a friendly against Barcelona. Cádiz stayed in La Segunda for all but one of the next 22 seasons, the only blemish being a season long trip to the Tercera in 1969-70. During this period, the club never effectively challenged for promotion, but that all changed with a runners-up spot and promotion to the top flight in 1976-77. Their first season in La Primera ended in relegation with the club bottom and eight points from safety. Cádiz however, liked the taste of La Primera and over the next eight seasons won promotion to the first division on three occasions. Central to this upturn was the enigmatic talent of Magico Gonzalez, a Salvadoran striker and club icon. The stadium underwent a 400 million peseta redevelopment in 1984 which saw a roof added to the west tribuna and the complete rebuilding of the northern fondo, which eliminated the curved end and brought the fans closer to the pitch. 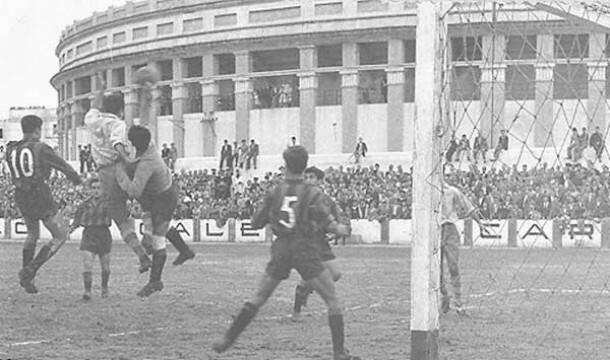 La Selección visited the Ramon de Carranza on three occasions between 1979 and 1986 and tested the new capacity of 23,000. Cádiz made the most of their improved surroundings and ran up eight consecutive seasons in La Primera from 1985. The club finally fell to La Segunda in May 1993 and a year later dropped a further division. In February 2002 the council announced that the stadium would undergo a major rebuilding programme that would see the ground completely reconstructed. In March 2003 work began on demolishing the South Fondo, with the east preferencia and tower following in the summer. In their place rose two twin decked open stands, with broad bands of yellow and blue seats. The new stand on the east side was flanked by two corner towers which contained office space. Delays in financing and construction meant that the latest addition was not officially opened until 3 August 2005, just in time for Cádiz’s return to the Primera for the 2005-06 season. La Selección paid a visit to the lop-sided stadium in November 2006, but lost 0-1 to Romania. 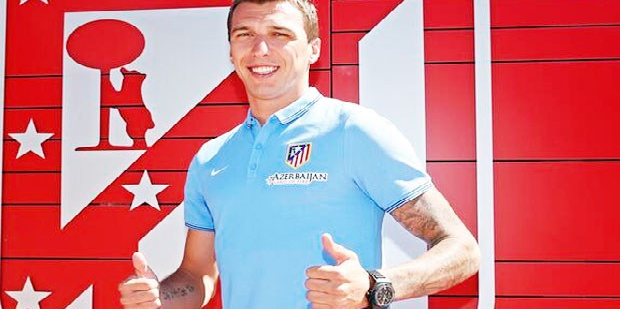 For the fourth time in the club’s history, their stay in La Primera lasted just the one season. Work began in November 2006 on a replacement of the North Fondo, which would be identical to the southern end. 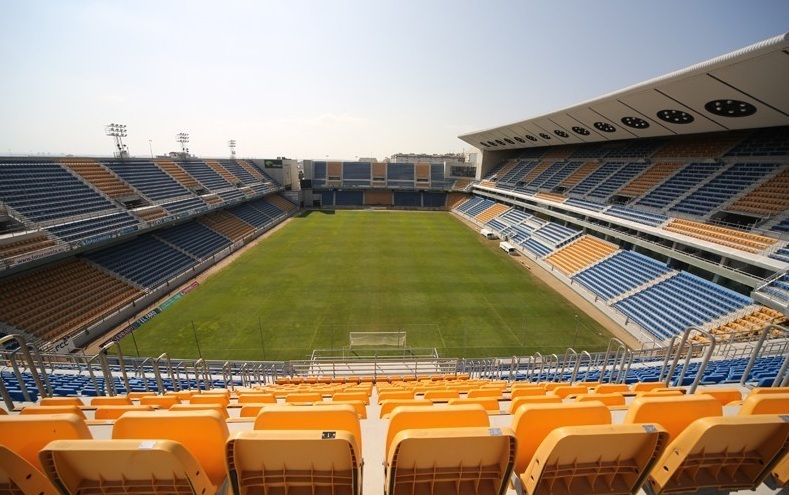 This took the better part of two years to complete and when it did open on 13 August 2008, Cádiz CF was back in Segunda B, all of which played havoc with club finances. 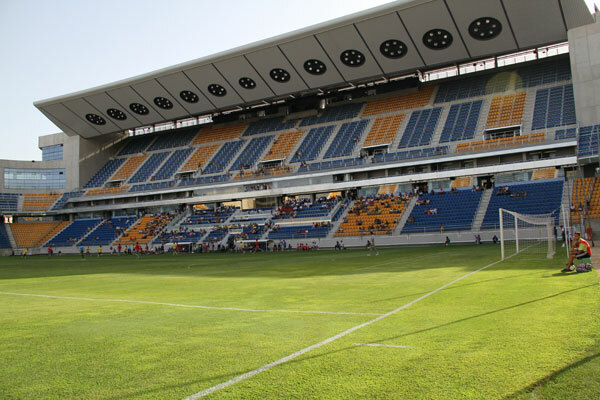 Despite teetering on the brink of bankruptcy, Cádiz and the local council ploughed on the final phase of the rebuilding, a replacement for the ageing west tribuna and corner stands to link the whole development together. Work began in the spring of 2011 and was finally completed in July 2012. The new stand took the capacity up to 25,033, but came at a cost of €26 million. It’s just as well that it looks stunning with two tiers of yellow & blue seats sandwiching two rows of corporate hospitality boxes. I particularly like the way that the floodlights have been incorporated into the fascia of the roof, looking like a sleek and very expensive cooker hood. The whole project cost upwards of €80m and council will now focus its efforts on selling as much of the hotel, retail & office space that occupies the guts of the stadium. With the stadium complete and fully enclosed, it should bring to an end a decade of uncertainty for Cádiz CF, leaving it to focus on returning to La Segunda, with perhaps occasional forays into La Primera. Oh, how they could do with a Magico Gonzalez now? Next Story → El Molinon – the perfect combination of history and modern day?